We had a jam packed schedule for out first full day in Namibia, with eight different stops throughout Windhoek and Katatura. Our first stop was the National Library and National Archives. At the National Library we were shown around by senior librarian Nomusa Senzanje. We got to see their ‘Namibiana’ collection, because the library tries to acquire everything published about Namibia, not just materials produced in Namibia. Our next stop was the National Archives, right next door to the National Library. There we met with chief archivist Ndahambelela Hertha Lukileni. She gave us a tour of their facility and showed us some interesting items in their collection: maps, historical photos of Namibians as German prisoners, the personal diaries of Hendrik Witbooi, a famous Namibian leader and the face of the Namibian ten and twenty dollar bills from the 19th century, as well as a copy of the German extermination order that led to the 1904 Herero genocide. Then we went to the Windhoek Public Library and were given a tour by Ruth Shikongo, one of the librarians there. 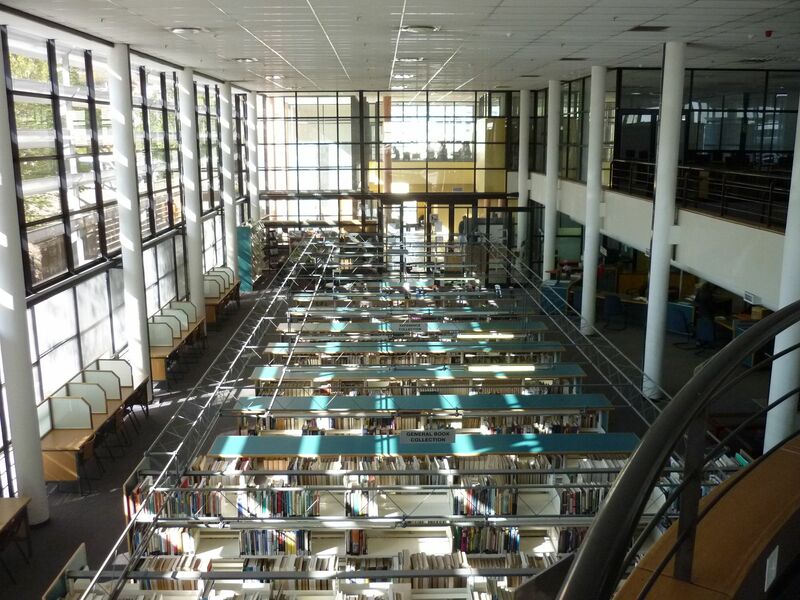 The library was whites only facility during apartheid, but now is open to anyone who wants to use its facilities. You don’t even have to be a resident of Windhoek. Although we visited in the middle of the day, the library was pretty full with most of the computers and study desks occupied.That was quickly followed with a trip out to the Katatura township to visit the Greenwell Matongo Library. To us it looked full, because almost every chair was occupied, but our host Mrs. Mariet Hayes told us that most of the time the library is so busy people have to sit on the floor. The library runs amazing children’s programs; they once had 800 children participate in a ‘Olympics’ where children represented countries they created in various events. The library also offers computer training, a community garden, and many other services for the community. In the afternoon, we had lunch with our host from the National Library and Archives Service, Veno Kauaria before embarking on a short tour of downtown Windhoek. We walked around downtown before going to the National Museum, where Jermain walked us through the exhibits on different Namibian cultures and wildlife. Finally, Jermain drove us up past the Namibian Parliament, the oldest German church in Namibia and then up a hill outside the city so we could get some beautiful views of Windhoek. By that point we were all pretty exhausted and headed back to the hotel. It was a very busy day, but a productive one. We had a full first day in Namibia. Browsing the new books at the National Library of Namibia. beautiful facility. Sun streamed in the windows in the bright, welcoming reference room. As soon as the library opened to the public at 9:00, the Internet stations were immediately filled. We got a behind the scenes tour to the legal collection and the Namibiana collection which included newspapers, media, and books all related to Namibia. Attached to the National Library is the National Archives building. Unfortunately, a recent burst pipe and subsequent leak damaged the reading room area of the Archives. Fortunately, none of the materials were impacted. We got to go to one of the rooms where the archives are stored as we heard about the rich collection which includes materials from the German colonial period, photographs, and records of Namibia through independence in 1990. We collectively held our breaths as the head archivist opened one of the bound volumes of records from the early 1900s to reveal the handwritten documents in German, and then as we talked we realized how much work there was to do in digitizing, cataloging, and working to make this collection more accessible to researchers and others. Community libraries are what we explored next with visits to three vibrant places. First stop was to Greenwell Matongo Community Library (you can see a great video made by the staff of the library here). We followed this to stops at the Community Library in Katatura and the Windhoek Community Library. The group around the circulation desk at Katatura Community Library. The whole group was impressed with the energy and dedication by the library staff who spoke with us. All of the libraries were heavily in use by students studying for upcoming exams. While there were certainly differences with American libraries, many of the issues that were shared with us were similar to what we face in the U.S.
A walk through of the National Museum of Namibia ended our day where we saw wildlife and displays about the different heritage, lifestyles, and history of some of the different groups that comprise the population of Namibia. Our driver and guide, who is a Herero, was particularly excited to talk with us about that part of the exhibit which engaged us all the more with what we were experiencing. 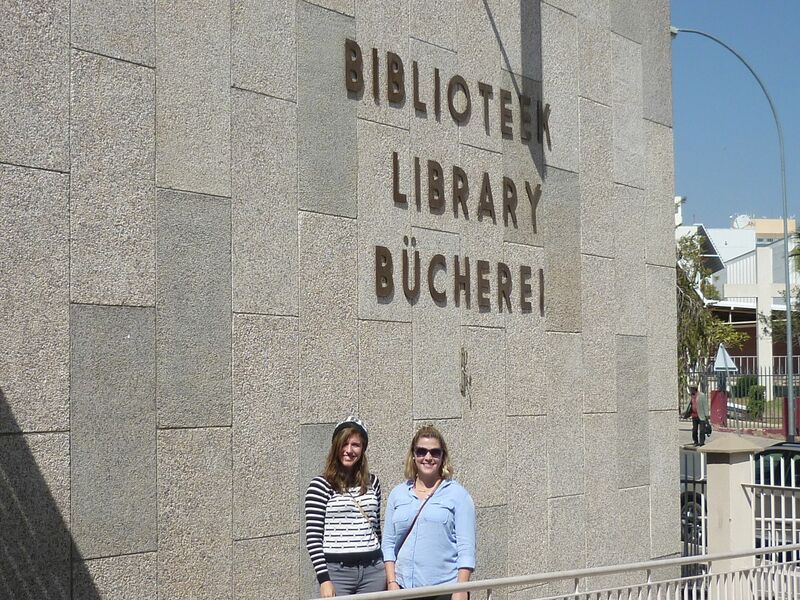 A Librarians Educational Guide to Traveling in Namibia in Two Weeks | Namibian Libraries on First Day in Etosha!